After the creations have been on display for a few days, they are carefully dismantled and all of the canned goods — upwards of 30,000 pounds of food from a single competition event — are donated to local food banks and pantries. Worldwide, last year’s Canstructions brought in more than 3.4 million pounds. The goal this year is 4 million. Snapshots of winners from the local competitions are shipped to the American Institute of Architects’ national convention, where they will be judged for international bragging rights next year. Now it’s your turn to do a little judging. To which of this year’s Norfolk Canstructions would you give top marks? Check out the images and then vote in our poll below. Bringing a whole new meaning to the concept of playing with your food, HBA Architecture & Interior Design constructed a giant Play-Doh set out of cans. “Oscar’s CANthedral” was inspired by the architect Oscar Niemeyer. This joint venture re-constructed a portion of the sculptural Metropolitcal Cathedral of Brasilia out of 1,900 pounds of food. 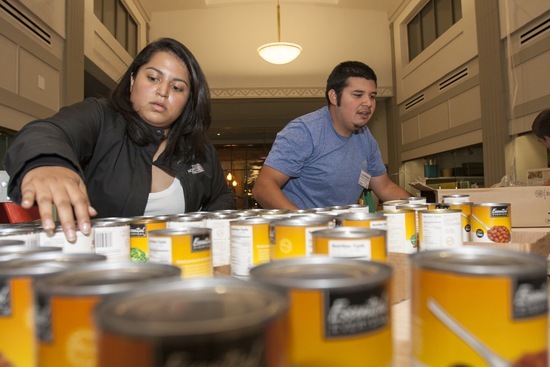 “Put Out the Flames of Hunger” — DJG, Inc.
Hampton University created a double-sided Canstruction with Queen Nefertiti on one side and the Sphinx on the other. Clark Nexsen, an architectural and engineering firm, designed a means of “Shipping in Healthy Foods” to help fight hunger. You can see fresh fruits and vegetables crates in cargo bay of the ship. You can watch the full report on Wednesday’s broadcast of the PBS NewsHour. Tune in to our Ustream channel at 6 p.m. EST to live stream the show or check your local PBS station’s schedule. All photos of the structures by Mark Hinkley, Canstruction Hampton Roads, Inc.